Explaining the value of the SATRA STM 505 Dynamic Footwear Water Resistance Tester. When footwear is claimed to offer a level of water resistance, the ability to accurately assess this can help support such claims and can make an important contribution to establishing or maintaining a brand reputation, or meeting a primary buyer’s specification. Records of test performance can also be used as part of a due diligence defence should disputes or consumer claims arise. The requirements for water-resistant footwear will depend on the application for which the product is intended. For example, the degree of water resistance required for everyday footwear will be different to that required for a golf shoe which, in turn, will be different to that required for a wet weather military boot. In order to assess the water resistance of whole footwear, SATRA produces the STM 505 Dynamic Water Resistance Tester. It has been designed to conduct tests to the requirements of SATRA TM230 which is a water penetration test method for whole footwear, ranging from everyday products to high-performance military footwear. This variation in application of the TM230 test method is possible as the performance criteria for the test (the water immersion level and number of flexing cycles) can be related to the intended use of the footwear and associated customer expectations. The SATRA STM 505 tester also allows tests to be conducted which conform to the requirements of European safety footwear legislation – for example, EN ISO 20344:2011 – ‘PPE – Test methods for footwear, clause 5.15.2 – Dynamic footwear water penetration test’. This test specifies a relatively low performance requirement of 4,800 flexes in a water level set at 20mm above the footwear featherline. However, in comparison to the EN ISO 20344 test, when using the same STM 505 test equipment to carry out an assessment against a military specification, a much higher performance criteria would be specified – such as 300,000 flexes with a water level set above the vamp. This represents a demanding test, both in terms of the number of flexes and the associated immersion time, which is over three days. When designing and manufacturing water-resistant footwear, it is important to select materials which are both resistant to water penetration and also non-wicking. Of course, this is only part of what is required to produce footwear which does not allow the ingress of water. Two other key requirements are necessary, Firstly, the combination of the footwear materials by the attention to design details (for instance, seam sealing and ensuring there are no wicking paths from the outer construction to the shoe lining including from decorations or brand labels) and secondly, ensuring that manufacturing methods and associated quality controls are in place to ensure consistency of manufacture. 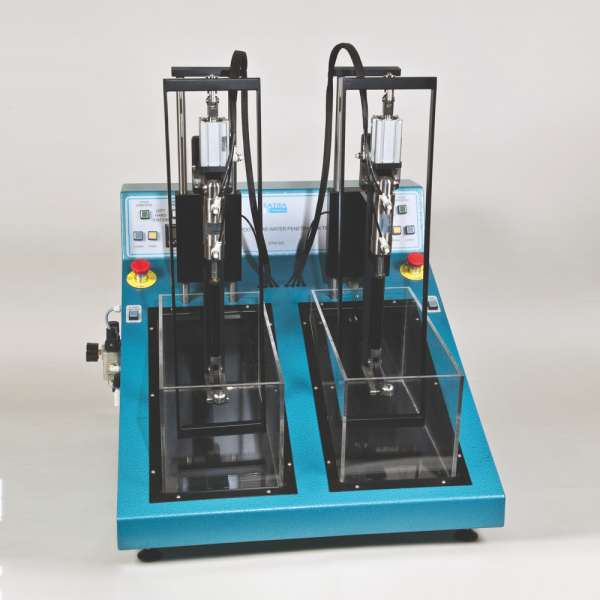 There are a number of SATRA test methods and a range of SATRA test machines which can be used for the evaluation of the water resistance and wicking characteristics of footwear materials, These tests can confirm the suitability of the individual construction materials used, and such assessments are essential prior to shoe manufacture. However, testing to SATRA TM230 allows a final assessment to be made of the integrity of the overall footwear design and construction against the ingress of water. The SATRA STM 505 Dynamic Water Resistance Tester flexes the footwear by means of a pneumatically operated mechanical foot. The test is conducted in a water bath with the footwear set to a defined water depth above the featherline. The flexing action represents a simplified walking action and is designed to induce flexing stresses in the primary areas known to be weak points (principally the joint region). Moreover, the cyclic uplifting of the toe produces realistic splashing of water over parts of the forepart not immersed. The flexing rate aligns to walking speed, so the immersion time relates to the time taken to cover the number of steps specified. A test which allows sufficient immersion time is important, as it can reveal any wicking effects which can provide a leak path for water ingress through the upper material to the lining. It is also worthy of note that, due to the nature of water transfer by wicking, water ingress through to the lining can occur above the immersion level – for example, by wicking up laces. Measuring the mass gain is optional within SATRA TM230, but it is highly recommended. Significant mass gain can be an important indicator of the quality of the upper material or, in the case of footwear using a membrane bootie, mass gain can be an indication that water has leaked into the space between the upper and the membrane. This is a condition which, although not a water leak into the foot space, can have detrimental effects with regards the thermal insulation, the overall weight and durability of the footwear. The STM 505 is a twin station, tabletop mounted machine, which allows each station to conduct completely independent tests. Footwear samples are slipped over the pneumatically driven foot mechanism, which has a hinged toe piece that flexes the footwear at a pre-determined rate, as specified in the test method. 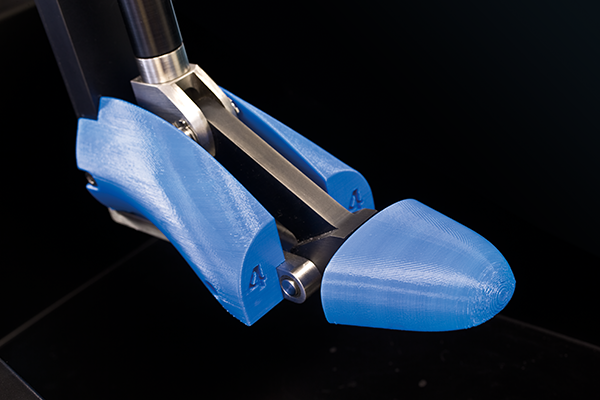 The mechanical foot has replaceable and adjustable sections to allow different footwear sizes to be tested. Test methods define the distance from the back of the heel piece to the pivot of the toe flex section, depending on the shoe size being tested. Different toe flexing sections can also be changed to suit the footwear size. When setting up a test, the test sample is clamped up against the underside of the mechanical foot and the whole assembly is lowered into the test tank. The water level is adjusted to a height above the featherline, as deemed appropriate for the footwear type or specification (or to a depth of 20mm in the case of the EN ISO 20344 test). The mounted footwear is raised out of the tank and the number of testing flexes is set for the first inspection point. On commencement of the test, the footwear is lowered into the tank and the flexing cycles begin. Periodic manual inspections are carried out during the test by removing the footwear and checking for internal leaks with tissue paper applied to the inside of the footwear. On completion of the set number of cycles, the footwear is automatically raised out of the water tank. One of the advantages of the pneumatic operation is that, although flexing is applied up to a specific angle, the force required to achieve this is limited. As such, it correlates better with real world usage of stiff-soled footwear which may not flex through a large angle in actual wear. In comparison, some other machines force a fixed angle of flexing irrespective of the sole stiffness – even if they would not flex to this degree in actual use. A recent development of the SATRA STM 505 is the introduction of an option for an automatic water detection system, combined with additional shaped elements added to the mechanical footform to aid the detection of water leaks. On detection of a leak, the test is suspended and the footwear assembly is automatically raised out of the water tank. The introduction of the automatic water detection expands the use of the STM 505 – for instance, allowing tests to be run overnight when manual inspection at intervals would not be practical. The determination of a leak by either manual inspection (identified by a damp patch of a prescribed area on tissue contact to the inside of the footwear) or the use of any automatic water detection will not precisely correlate. However, customers will be able to develop their own experience in the use of manual or automatic water detection, depending on footwear type or typical failure mode. The SATRA STM 505 represents a powerful tool for verifying the resistance to water ingress for a wide range of footwear types (except high heeled footwear). This, together with production quality auditing, can help to ensure that the footwear is fit for purpose or meets claims made for the product’s water resistance. In the event of water leaks occurring during a test (such as when testing to SATRA TM230), the manufacturer or brand is able to investigate the failure mode and hence apply corrective actions. SATRA has test evidence that well-made footwear manufactured with highly water-resistant materials can achieve very high performance values under test (in some cases more than 1,000,000 flexing cycles) – even with deep immersion levels. Equally, we also see footwear which develops leaks at very low numbers of cycles in low immersion depths. In many cases, small attention to the details of construction, design or a material used can make a significant difference to the leak resistance of the footwear. SATRA consultants can provide consultancy for members seeking to improve the water resistance of their footwear. Photograph at top of page shows the mechanical foot fitted with automatic water detection components. Email test.equipment@satra.com for more information on the SATRA STM 505 Dynamic Water Resistance Tester. Please contact footwear@satra.com to discuss how to improve the water resistance of your footwear. This article was originally published on page 38 of the October 2014 issue of SATRA Bulletin.